Miners, : MARCELA MORAGA M.
Andean Textiles are an important means to transmit and preserve essential life traits in their society. Just like a book, they are created in order to transfer data regarding their local economy, historical incidents, and aesthetical values. Therefore, the tradition of weaving is very important throughout the Andean community. There are many different techniques, layouts and designs. Main subjects include animals and plants. 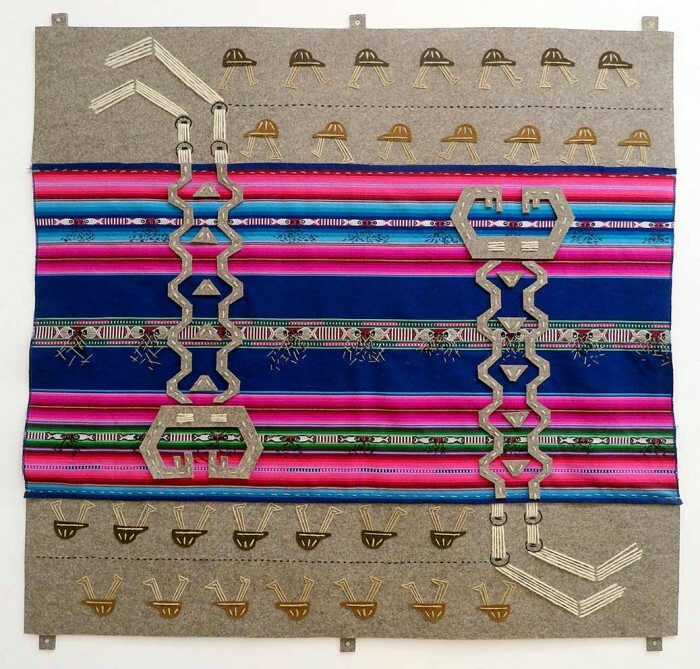 The artist intervenes different Awayos textiles using felt and embroidery in order to illustrate her own story about the extraction processes of minerals in the Andean mountain range. This textile description talks of the resulting contamination and drought of the waters, and the ensuing social and economic problems that affect the Andean indigenous people.